North Sea Port says it has brought two new shore-power connections into service in Ghent. Said to be a first for inland waterway vessels, the units have been installed at the Sifferdok's inlet dock and were officially commissioned on Friday March 1, 2019. Later this month, a further two shore-based power units will be installed in Terneuzen, at the month of the Ghent–Terneuzen Canal, bringing North Sea Port to a total of 23 shore-based power units offering a total of 80 connection points. 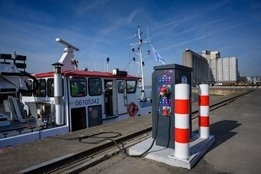 The port says the shore-side power available in Ghent and Terneuzen is 100% renewable. By plugging into shore power, vessels are able to switch off their engines and reduce at-berth emissions.